04.10.2012, Anonymous protest, Rochdale Town Centre, 17a Baillie Street OL16 1JA Rochdale, 09:00 – 16:00. Facebook event. 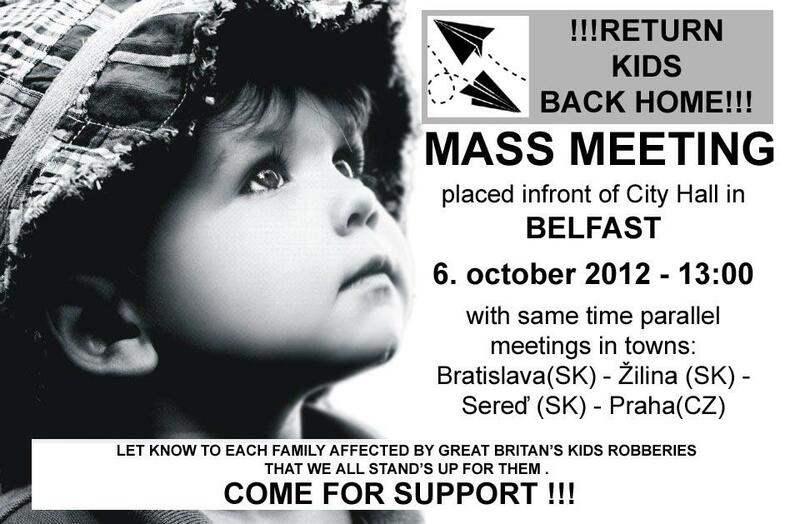 Protest to be held for the Crimes against the innocent children, Who have been let down massively by the system!! A call for Rochdale council to resign from the jobs on the board, and to inform the Public of what their Local council has covered up and allowed what happened to go ON! 10.10.2012. Be involved in referendum in Ireland!, Web pages, Full text of the referendum – Thirty-First Amendment of the Constitution. Irish Times – Wording of children’s rights referendum is published – The Government today published the wording of the children’s rights amendment to the Constitution. If you live in GB, ask your member of parliament to support John Hemming’s HUMAN RIGHTS AND FORCED ADOPTIONS IN THE ENGLISH AND WELSH COURTS. Go to page http://www.writetothem.com/ and enter your post code, It will show up representing MPs and click on them and write some relevant message + add link to HUMAN RIGHTS AND FORCED ADOPTIONS IN THE ENGLISH AND WELSH COURTS. SIgn the petition Help save Levis & Ryan campaign, Please sign this petition to Help save my two sons Lewis and Ryan from Forced Adoption, and to save them from a life in the uk care system that is clearly failing them. The UK End Child Abuse Rally (formerly the UK Rally Against Child Abuse) is an opportunity for victims, survivors, families, supporters, support organisations and campaigners to come together and unite for the cause to end child abuse. There will be speakers raising awareness of the appalling state of the UK SS system, raising questions such as who protects children in care? YouTube video from the event. This entry was posted in How can I help and tagged Child abuse, Demonstrations, Ivana Boorová, John Hemming, Petition, Thirty-First Amendment of the Constitution, UK Social Service on 24. septembra 2012 by valasek.